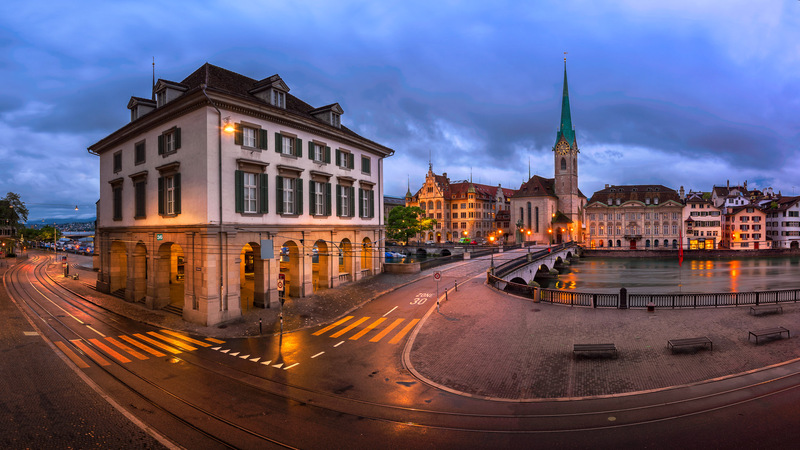 After photographing Fraumunster Church by twilight the day before, I decided to go back and photograph it again in early morning light, before the city awoke and the tourists descended. June 2016, panorama from 2 horizontal images, additional exposures for highlights, focal length 17mm, aperture f/11, shutter speed 13 seconds, ISO 100, tripod. It’s difficult not to be impressed by the lovely church, its spire instantly recognizable over Munsterhof Square, a lovely public space built improbably on the site of a pig market. Aside from its blue-green spire, it’s the windows of Fraumunster that capture you; long, thin panels by Marc Chagall, each done in a predominant color. A person can’t help but be awed standing underneath those windows, bathed in blue light created by the hands of Chagall. I woke early, while the city was still dark, and while most of Zurich still slept, I carried my equipment along the Limmat. The sun was beginning to break by the time I reached the Helmhaus and began to set up for the shot. For this one, I wanted a wide shot with the Helmhaus in the foreground and the lovely, green-spired Fraumunster in the background. Shooting from a slightly elevated position, I used a panoramic technique to capture the old city from this vantage point. In the faint light of a new day, the church was particularly charming.